With the patent-pending Hybrid DECI Duo, support removal and surface finishing of 3D printed parts is automated in a single, multi-functioning system and designed with a space-saving footprint that optimizes production floor space. The Hybrid DECI Duo has been engineered for the most advanced 3D print materials such as resins, thermoplastics, and metals, and offer fast cycle times for even the most complex parts, including those with internal channels, organic geometries, and honeycombs. The DECI Duo is capable of removing supports and finishing surfaces of the following 3D printing technologies: FDM, SLS, SLA, Multi Jet Fusion (MJF), DMLS/Binder Jetting, and more. Through a combination of optimized energy, exclusive chemistry including detergents and suspended solids, the system is guided by PostProcess’ proprietary AUTOMAT3D™ software to remove support material and provide the desired surface finish while preserving fine-detail part geometries. The Hybrid DECI Duo thinks like a member of your team, monitoring and reacting in real-time to maintain optimal conditions with sophisticated features like pre-programmed preventative maintenance schedules, intelligent cycle time programming, and one-touch repeatability with recipes stored within the software. Thoughtfully designed, the Hybrid DECI Duo also includes an LED lighted chamber, noise reducing features for a low dBa, and the flexibility of a manual mode to allow for hands-on part finishing. 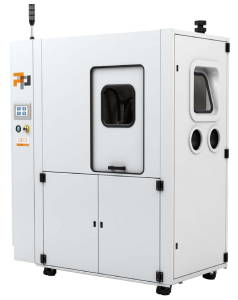 To optimize efficiency, it also includes casters for easy installation, a smart electrical panel design, and pass-through door capability to help streamline your entire additive manufacturing operation.